Interactive maps can be very useful for trip planning, and if you have a GPS-enabled device such as a smartphone, they can help you find your way once you’re at your destination. I’ve listed five free maps that have helped me discover outdoors activities in Ontario. Hope you find them useful as well! The Ontario Trails Map is the ultimate trails map for Ontario. Find trails by simply scrolling across the map. Alternatively, you can search for a trail by name or by activity (and by activity I mean anything from ATVing to ice climbing). 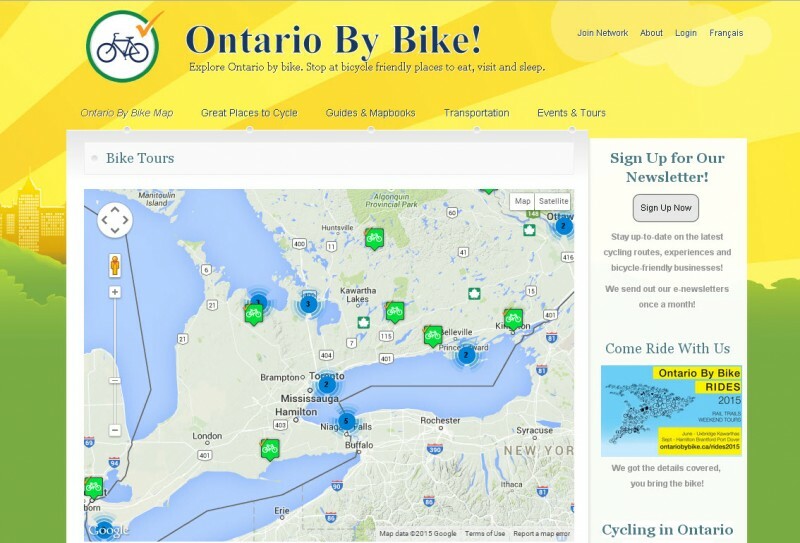 The Ontario by Bike map highlights resources for cyclists rather than specific trails. It’s very useful if you’re planning your own route and want some insight into nearby accommodations, bike shops and other services. 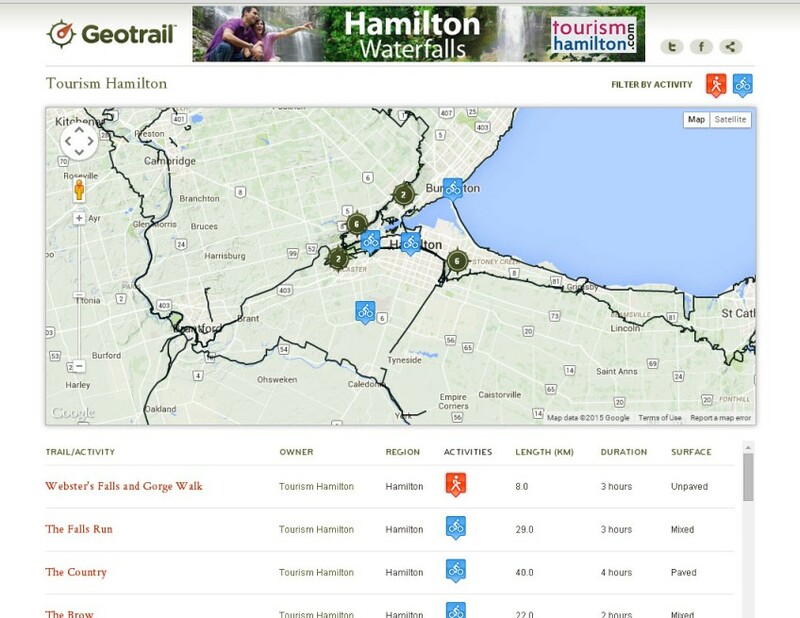 Geotrail is a Canada-wide map that currently provides limited detail for most of the trails it features in Ontario, however there’s a detailed tour of ten Hamilton waterfalls that I would recommend. This is one of my most favorite maps. Camping and Ontario parks enthusiasts would love it. 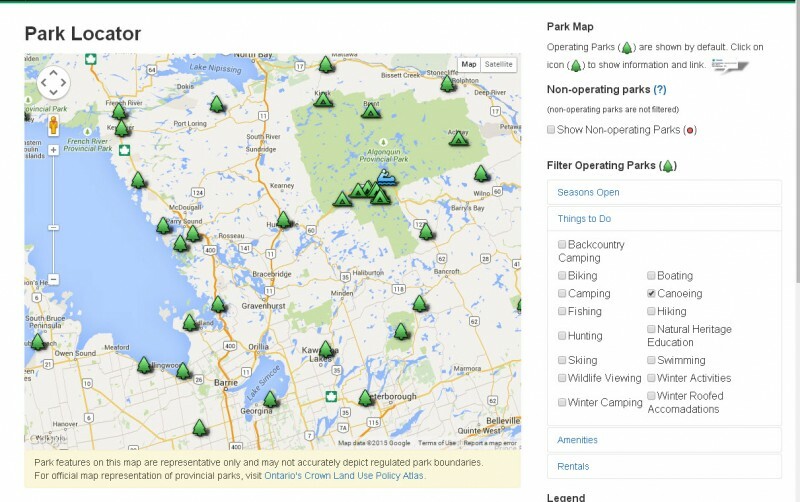 The map spots all the 300+ Ontario provincial parks and lets you filter your selection based on activities found in a park and the amenities offered etc. Park locator is a very helpful tool in the sense that it can save you hours of time. Imagine browsing through each provincial park home page searching whether the park offers winter camping or whether it has roofed accommodation or whatever it is that you are looking for! This initiative was set up in 2011 to raise awareness of trees in urban environments. 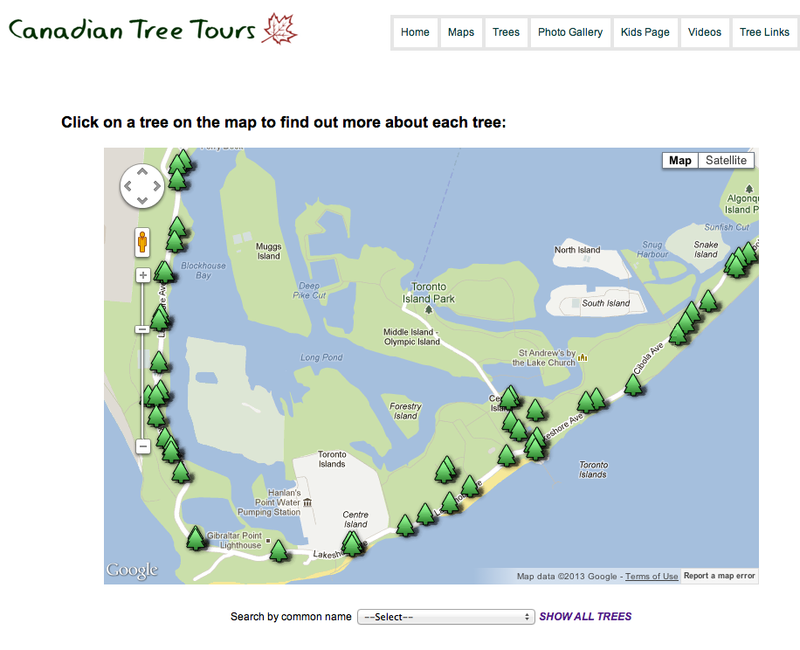 Use your phone or download and print a map in advance and discover more about the trees around you. It’s a great concept, but unfortunately the Canadian Tree Tours currently only features four Toronto-based maps (Toronto Island, Trinity Bellwoods, High Park and Queens Park). They’re well worth checking out though if you’re in the area.